Quarterbacks: Kelson Andrade (Kauai), Brandon Howes (Konawaena), Cody Lui-Yuen (Radford), Chase Newton (Kamehameha-Maui). Running backs: Makena Johnston (Kalaheo), Fitou Fisiiahi (Kaiser) Reggie McFadden (Kauai), Tobias Powell (Radford), Jordan Ross (Iolani), Christian Whitehead (Lahainaluna). Receivers: Chad Hanaoka (Iolani), Alapaki Iaea (Kamehameha-Hawaii), Kanoa Iwasaki (Kauai), Chase Kanekuni (Iolani), Keoni Keanini (Kamehameha-Maui), Blaise Manabe (Kalani), Kierren McGhee (Pearl City), Nicky Palleschi (Hawaii Prep Academy), Thomas Pule (Waialua), Timothy Rivera (Pearl City), Roycen Routt (Pac-Five), Kaikea Sonoda (Kapa'a). Offensive lineman: Maka Ah Loo (Kapa'a), Makoa Chapa (Konawaena), Nate Herbig (Kauai), Kaleo Lindsey (Anuenue) Donnel Lefotu (Pearl City), Clint Matais (Kauai), Kimo Moses (Anuenue), John Wendell Nisa (Kaiser), Vaituuloa Puteni (Lahainaluna), Danniel Sulunga-Kahaialii (Lahainaluna). Utility: Tristan "Pono" Bukoski (Kauai), Makoa Filikitonga (Lahainaluna), Kalawaia Judd (Kauai), Turtle Kuhaulua (Kapa'a), Taleon Lele (Waialua), Ranan Mamiya (Saint Francis), Destin Miguel (Waimea), Caanan Saole (Kaiser). Defensive lineman: Rusty Ah Loo (Kapa'a), Kili Barozzo (Nanakuli), O.B. Cordero (Hawaii Prep), Derek Costa (Kaiser), Josiah Kalama (Waialua), Lai Matais (Kauai), William Nipp (Kamehameha-Maui), Alapati Scanlan (Pearl City), Penisama Taufa (Lahainaluna), Lachoneus Tautuiaki (Saint Francis), Blaise Yamauchi (Kalani). Linebackers: Edwin Aumua (Damien), Jake Bactista (Pearl City), Kelii Efhan (Kauai), Nainoa "Bubba" Ellis-Noa (Konawaena), Tommy Fisher (Kaiser), Mosese Fifita (Kapa'a), Leeland Lauti (Damien), Wyatt Maa (Iolani), Blayne Won (Saint Francis), Evyn Yamaguchi (Konawaena). Defensive backs: Daniel Alonzo (Kapa'a), Damien Butac (Kauai), Preston Dudoit (Kalani), Jared Kanoa (Pac-Five), Andrew Killen (Radford), Maxwell Look (Iolani), Jordan Miyahara-Young (Konawena), Jordin Pacheco (Radford), Lii Purdy (Hawaii Prep Academy), Quinton Slade-Matautia (Iolani), Kevin Togami (Iolani), Kristian Vaana-Kikuyama (Pearl City). Kickers: Kailoa Akoi (Kamehameha-Maui), Alex Brost (Hawaii Prep Academy), Keoni-Kordell Makekau (Iolani), Matt Sai (Kaiser), Marc Teshima (Kalani). 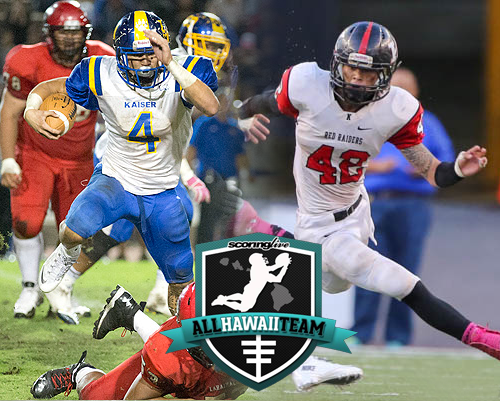 Other coaches that received consideration: Robin Kami (Pearl City), Rich Miano (Kaiser), Greg Taguchi (Kalani), Robert Watson/Garret Tihada (Lahainaluna). No one terrorized the scoreboards of Division II foes like Thomas Buntenbah-Leong did. The 5-foot-10, 185 pound senior accumulated 149 points in 12 games, the most by any player in the state. Blessed with a 4.42 time in the 40-yard dash, Buntenbah-Leong was a threat to take it to the house every time he touched the ball. Opposing defensive coordinators could only help to limit this multi-purpose player's effectiveness on the gridiron. Most of the damage that this 5-foot-11, 185-lb senior caused was on the ground. He finished his senior campaign with 757 rushing yards and 16 touchdowns on just 95 carries. That's an average of eight yards per carry, as well as a rushing touchdown every six times he touches the ball. Spectators would either marvel or groan as Buntenbah-Leong often ran circles around defenders trying to stop him. In addition to his talents at running back, Buntenbah-Leong was a superb return man, and led the state with six special team returns for touchdown. Scoring a touchdown against the Kaiser Cougars was almost a two-edged sword as all momentum could easily be lost with Buntenbah-Leong threatening to return the ensuing kickoff for six. It wasn't till the Division II title game that a team made the wise decision to kick it out of bounds and take a penalty instead. The Kaiser Cougars had many talented players on their championship squad, but one would be hard pressed to argue that anyone was more important to their team's success than Buntenbah-Leong. Selecting a defensive player of the year is a tough task in itself. Defensive stats are rarely taken down or reported so realizing the impact that a defensive player has requires a lot more homework. Speaking of homework, players on the defensive side of the ball often have assignments they must do to stymie an opposing offense. No player did this as well as James Bukoski, a three-year starter at middle linebacker for the Kauai Red Raiders. Bukoski posted one of the best defensive performances in the state tournament this year, finishing with 22 tackles and three interceptions. The 5-foot-8, 170-lb senior might not have been the flashiest hitter, but showed textbook technique, excellent pursuit, and seemed to always take the right angle to limit yardage gained by opposing ball carriers. A lot of talk in college football is the notion of needing a 'Heisman' moment to win the most prestigious award. And the one play that really signified Bukoski's defensive prowess actually involved our pick for Division II offensive player of the year. After giving up a score to the Red Raiders in the first half of the title game, the Cougars turned to Leong, who caught a swing pass out of the backfield towards the weak side of the formation, avoided at least two defenders, and had open field in front of him for the tying score. That was not to be however, as Bukoski was able to come from the opposite side of the field and chase down Leong for the touchdown-saving ankle tackle. Bukoski added an interception a few plays later that helped Kauai take a 7-0 lead into the locker room, the first time that Kaiser was held scoreless in the first half all year. The Red Raiders' defense finished the season as one of the best in the state – limiting opponents to less than eight points per game – something they would not have done without Bukoski locking it down in the middle of the field. A top two finish in the final ScoringLive Division II rankings, a trip to the state title game and a near perfect season. Not bad for a first-year head coach under the interim tag. What Tommy John Cox was able to accomplish in his first year piloting the ship was nothing short of a Cinderella story. Despite playing in an underrated Kauai Interscholastic Federation league, Cox and the Red Raiders were able to go unbeaten into the last week of the season. And while the Red Raiders came up short against the Cougars, they will be remembered for ending Iolani's six-year dynasty. One of the reasons why the Red Raiders had such a great season was that Cox was what you would call a "player's coach." The Kauai football team by all accounts was a fun-loving bunch, finding many ways to enjoy themselves off the field. That might sound like a headache for most coaches, but Cox and the rest of the coaching staff were able to translate the fun off the field, to success on the field. Despite the accolades during his first season at the helm, the future of the Kauai football team is still uncertain. All year long Cox has said that this would be his final year in the coaching ranks, as he will be tying the knot with his fiancee Leilani in January. Whether or not he returns as head coach of the program, there is nothing in the world that can take away the laughter and memories of the Red Raiders' amazing season.